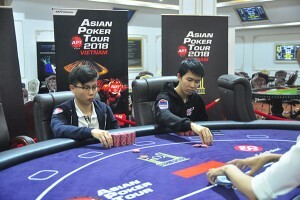 APT Vietnam 2018 wrapped up another starting day with 140 entries turning up at Pro Poker Club for the VND 6 Billion Guaranteed – MAIN EVENT. By the end of the scheduled nine rounds, only 52 remained with India’s 2018 WSOP bracelet winner Nikita Luther amassing the largest stack of 422,300. One of the final hands Luther won was against Josh McCully. On a board of 5♣ 8♠ 8♥ Q♣ 6♣, and a pot of around 13k in the middle, McCully bet 16.8k, Luther raised enough to put the short-stacked McCully all in. McCully tanked until the clock was called. He timed out and was forced to muck. 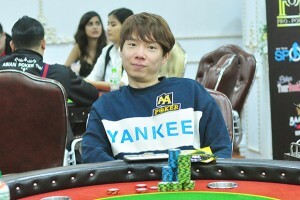 Earning the second largest stack of the day was APT Finale Macau 2016 Main Event winner, Soo Jo Kim with 365,700. And rounding out the top three was Vietnam’s own Quang Nguyen with 301,100. 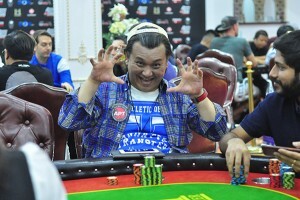 Several Japanese players made it through this heat with Aso Seitaro leading his crew with 257,400. However for fellow compatriot Takao Shimizu, he got hit with a sick bad beat to send him packing just before the close of day. Shimizu had K♦ K♥ and was up against I-Cheng Lin‘s 2♣ 2♠. The board completed to an eye-popping 2♥ 10♦ 8♦ K♣ 2♣ for quads over full house. Staging a late-game run was Indian pro Raghav Bansal ending the day with 152,800. Bansal pushed out big-stacked Seitaro off a pot, shoving on a board 6♦ 3♦ 4♠ 8♠. 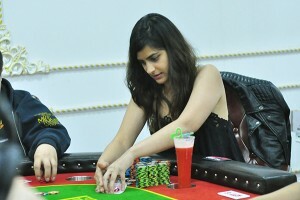 Seitaro folded and showed 4♦ 7♦ and Bansal returned the gesture showing Q♥ 10♦. Bansal won the next hand by railing a player with 2♦ 2♥improving to a set against A♦ Q♣ top pair on a board that ran 9♦ 2♣ A♥ J♥ K♠. Also through to the next round is Norway’s Henrik Tollefsen though with a short stack of 30,400. 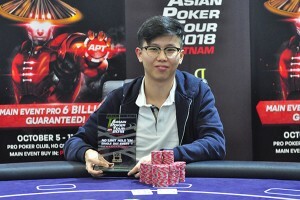 Tollefsen is a two-time APT Main Event champion. Day 1B survivors have a break before moving on to Day 2 on Tuesday, October 9, 2018. *The three starting days play a total of 9 levels. Each level runs for 60 minutes. Registration closes in Day 2 at the start of Level 10. *Eliminated players wanting bubble protection on the next starting day will have to qualify again. APT sponsor, CoinPoker, will also be extending great promos to our Main Event players. Players can receive their full rake back by simply emailing CoinPoker with a copy of your receipt. You will be credited on your CoinPoker online account. There is also the”Last Man Standing” promo. 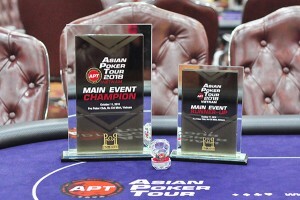 The last player in the Main Event wearing the CoinPoker patch will receive a free seat to the APT Finale Philippines 2018 Main Event. 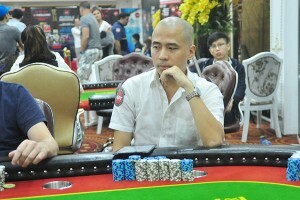 Singapore’s Feng Zhao came out on top of the lone side event on tap, the NLH Single Day event. 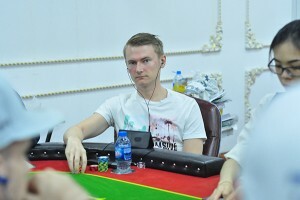 He defeated Thailand’s Thanisorn Saelor in a quick three-hand heads up match to ship in the VND 135,630,000. 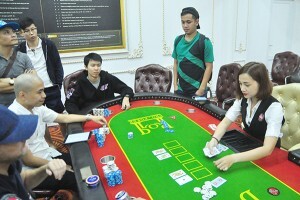 The event stormed in with 113 runners – 92 players and 21 re-entries – for a prize pool of VND 548,050,000. With blinds increasing every 20 minutes, the field quickly tightened to the bubble round with 20 players vying for a piece of the pie. After several all ins, Julien Tran shut the door on a player with A♣ Q♣ forming the better spread overK♠ Q♠ on a blank board of 5♥ 8♣ 4♠ 8♠ 6♦. Tran went on to reach the official Final 8. The last race to the title proceeded in turbo speed with a player falling at every orbit. At four remaining, Erik Billgren spiked a lucky flush on the river to cripple down Tran. The hand was K♥ J♥ versus Q♦ Q♣ with the board running 8♥ 3♣ J♠ Q♥ 2♥. 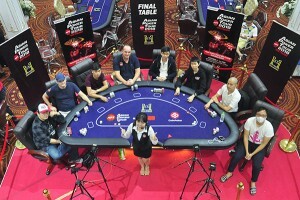 A few hands after, Tran exited in 4th place. Despite the stack boost, Billgren was downed in 3rd place by Zhao who went on to face Saelor for the title. 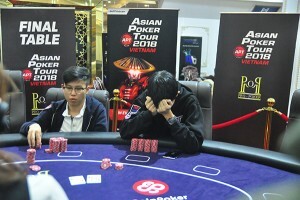 Zhao had a 3:1 chip edge that when he lost the first hand K♦ 3♦ bested by A♦ 8♥, he was still up after paying the double up. The second hand between them was another all in ending in a split pot. The third hand was the final hand. Saelor shoved with K♦ 10♥ and Zhao called with A♣ 9♣. 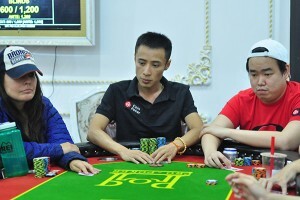 The community spread landedA♠ J♠ 4♥ K♠ 9♦ to award Zhao the victory.